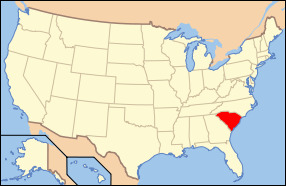 The state of South Carolina is located within the Deep South region of the United States and is bordered by North Carolina, Georgia, and the Atlantic Ocean. The state name originated as a means to honor King Charles I. The state was originally a part of the Province of Carolina, and was one of the 13 original colonies that had declared its independence from British rule in the American Revolution. The state became the 8th to be admitted to the U.S. In May of 1788. South Carolina is the 40th ranked most extensive state with a total land area of 32,020 square miles, and is the 24th ranked most populated state with a total population of 4.68 million people as of 2011. The capital of the state is the city of Columbia which also remains the largest city in the state. South Carolina is recognized to have a humid subtropical climate, however the higher areas of elevation are known to have less subtropical traits versus the regions on the Atlantic coast. During the summer the state is hot and humid, and the winters are generally very mild especially in coastal areas of the state. 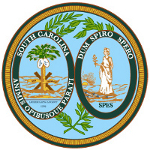 There are several major industries in South Carolina however the main ones are tobacco and soybean farming, chemical manufacturing, textiles, machinery, electronics, processed foods, tourism, and paper products. President Andrew Jackson was born in Waxhaw, South Carolina, and was the 7th president of the United States serving from 1829 to 1837. The major bodies of water in the state include the Santee River, Savannah River, Edisto River, Lake Moultrie, Lake Murray, Lake Marion, and Hartwell Lake. The highest point of elevation in the state is Sassafras Mountain which sits at 3,560 feet above sea level. The state nickname is the “Palmetto State”, the state bird is the Carolina Wren, the state animal is the Whitetail Deer, the state fish is the Striped Bass, the state flower is the Blue Granite, and the state tree is the Sabal Palmetto Tree. South Carolina remains a top destination for tourists and is home to a number various activities making it an ideal state for tourists and sight-seers alike. Earthquakes do occur in South Carolina. The greatest frequency is along the central coastline of the state, in the Charleston area. South Carolina averages 10–15 earthquakes a year below magnitude 3 (FEMA).